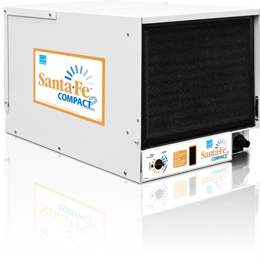 The Santa Fe Advance2 has a horizontal configuration and unique dual airflow outlets that make it an ideal solution for basements and crawl spaces. Installation flexibility makes the unit ideal for almost any application. 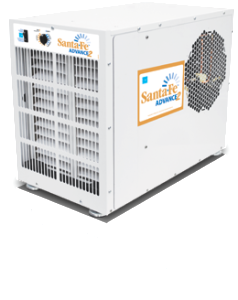 No conventional dehumidifier can perform as efficiently and effectively in basements and crawl spaces as the Santa Fe Advance2. 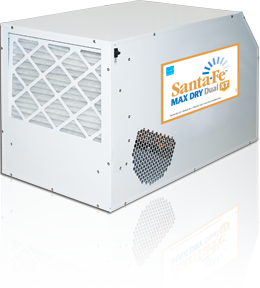 The Max Dry Dual XT has a horizontal configuration and dual outlet design. It can cover up to *3,600 square feet, making it the largest unit in the Santa Fe family. Its insulated cabinet allows for quieter operation and enables its exceptional performance in all larger basement and crawlspace applications.